Maize (Zea mays L.) green forage, particularly when it contains the stalks, leaves and ears, is an energy-rich feed for ruminant livestock. While maize forage is usually ensiled in cooler regions, year-round maize production in the tropics may allow the continuous harvesting of green forage, making ensiling unnecessary (Brewbaker, 2003). Grazing whole maize plants also provides green fodder to livestock in periods of scarcity (dry and hot summers, and winters) (Potter, 2012; Newport, 2006). In areas where conditions are harsh and forage is scarce, maize green forage is a valuable source of fodder for smallholder owned stock (see Forage management below) (Methu et al., 2006). Maize is a high energy feed, better than most other tropical forage crops, of which the DM is often below 40% digestible. In the tropics, while grass forages must be harvested almost monthly, maize forage matures within three months, is harvested only once, and does not require much labour and high machinery costs (Brewbaker, 2003). Baby corn is a much appreciated vegetable that is increasingly consumed worldwide. Baby corn consists of immature cobs of maize plants harvested young, 2-3 days after silk emergence and before pollination. Baby corn can be obtained from the same hybrids as other maize crops or from adapted hybrids that are shorter and develop several stalks (Indriani et al., 2015; Kaiser et al., 2011). Baby corn is a fast growing cash crop requiring only 55-60 days between planting and harvest (Srichana et al., 2014). Because it is harvested at an early stage of growth, the crop residues including stalks, leaves, husks and silk provide very good quality fresh forage, palatable to livestock (Indriani et al., 2015; Srichana et al., 2014). In the tropics, it can be grown all year round. 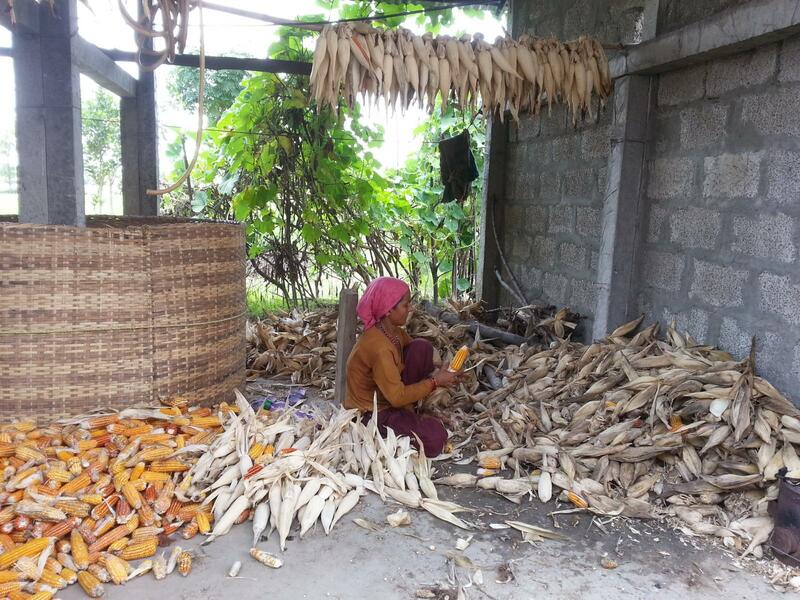 In Thailand, baby corn production was over 276 000 t in 2013. As edible baby corn cob accounts for no more than 15% of the production, it can be assumed that the remaining 85% could provide more than 1 million t of forage (green matter) (Srichana et al., 2014). Baby corn forage can be fed fresh or ensiled. Note: fresh maize stover consisting of stalks and leaves left in the field after the grain harvest is dealt with in the Maize stover datasheet. Maize is a native to Central America, which spread to the Caribbean, and Southern and Northern America. Thanks to genetic selection and hybridisation, it now grows worldwide between 58°N in Canada and Russia and 40°S in Chile and Argentina, and from sea level to an altitude of 3800 m in the Andean mountains (Ecoport, 2010). In the 18th and 19th centuries, maize was a multipurpose backyard species in Europe. In France, maize was densely sown to provide green forage, called "fourragettes", beyond the northern limit for grain (South Brittany, former Maine, Paris Basin, Lorraine). It was used in livestock rations during late summer until the first frosts, when other grasses were scarce. This forage system was used until the 1970s, when new early hybrids made possible the production of maize silage (Renoux, 2016). Optimal growth conditions are 18-21°C average day-temperatures, annual rainfalls of more than 750 mm, and deep, well-drained rich soils. However, maize withstands annual rainfalls ranging from 230 to 4100 mm, a pH between 4.3 and 8.7, and a great variety of soils. Frost kills the plants. Drought is detrimental at flowering as it affects pollination and impairs yields. Maize has no tolerance to flooding. Fresh matter yields of maize green fodder range from 10 to 50 t/ha (FAO, 2016). Yields obtained from baby corn crops range from 31 to 46 t/ha (21-25 t DM/ha) (Chaudhary et al., 2012). Note: information about the management of maize green forage is scarce. Most experiments are reported from the US Extension services and the recommended practices are dealing with herbicide-resistant GM maize. Maize intended for forage is reported to be suitable in no-till management systems and should be sown in pastures (not in cropland) where it provides good yields of green fodder during the hot summer season. Pasture management consists in properly weeding the field before letting cattle in to graze. 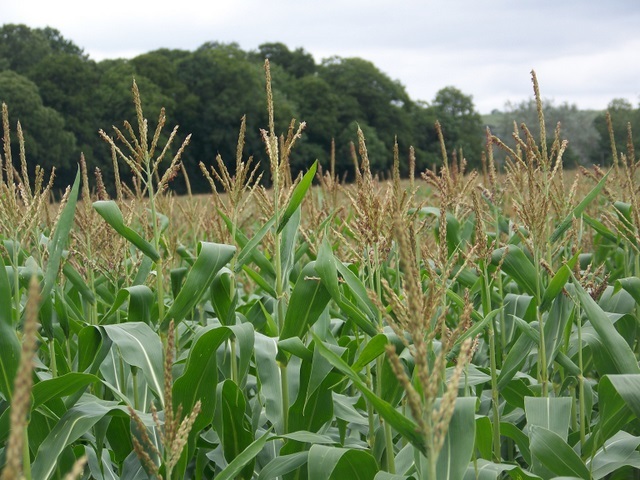 The maize understorey may be so palatable to cattle that it can deter grazing of the maize plant and thus reduce the energy intake potentially achievable if the maize was eaten (Newport, 2006). Once the maize is at late milk-stage, cattle are allowed to enter the pasture. In the Southern states of the USA, cattle are fed on Bermuda grass (Cynodon dactylon), switchgrass (Panicum virgatum) or fescue prior to grazing maize pastures during hot summers. Cattle can have access to the whole stand, but strip grazing is usually preferred by farmers as this method limits the risk of acidosis due to high energy intakes, and is also less wasteful (Newport, 2006). In Canada, it was reported that the grazing period could be extended from mid-September to mid-December as maize stalks remain upright after a fall of snow. Grazing maize helped saving forage for winter, reduced work, favoured direct manuring and kept cows healthy (Potter, 2012). Thinning (provided 3 seeds have been previously planted at each site) consists in cutting one of the supernumerary plants and will allow green fodder harvest one month after sowing. This methods yields almost 8 t of green forage/ha. This forage can be fed fresh or ensiled. Defoliating (removing one or two leaves/plant every week, once the silk has turned brown in over half the crop) will provide about 4.5 t of green matter/ha. Topping (cutting the green part above the cob, 7 weeks after silk emergence) yields about 7 t of green matter/ha (Methu et al., 2006). In India, it is possible to have 3-4 harvests of baby corn in a year. Once baby cobs are harvested, the remaining stalks are still green, succulent and nutritious, with a high digestibility (Chaudhary et al., 2012). Maize crops drain nutrients from the soil, do not compete well with weeds after the seedling stage and are subject to many diseases and pests. Therefore, the cultivation of high-producing maize requires high fertilizer levels as well as herbicides, pesticides and fungicides, which are deleterious to biodiversity and soil conservation. Heavy fertilizer applications can cause nitrate leaching and soil erosion. Herbicides may contaminate the groundwater while pesticides alter biodiversity (European Commission, 2000). In developing countries, where fertilizers are too expensive for general use, the nutrient uptake is higher than when fertilizers are regularly used, thus reducing soil fertility and causing further soil degradation (CIMMYT, 2009). The debate about the environmental impact of GM crops is complex and a full discussion of the issue is beyond the scope of this datasheet. GM maize varieties that are herbicide-resistant or pest-tolerant have been commercialised since 1996, and their potential environmental impact has been the subject of considerable debate. Some positive impacts have been reported for GM maize, notably a reduction in herbicide and pesticide use, as well as certain benefits for wildlife (Edwards et al., 2009). However, potential negative effects have also been alleged, including the alteration of the DNA of soil microflora, and deleterious impacts on useful insects, such as butterflies and bees, and on non-GM plants (including maize) through genome transfer (Dale et al., 2002). Maize green forage has a relatively low protein content (3-13% of DM) and a high fibre content (crude fibre 19-36% of DM). Depending on the stage of harvesting, it can be rich in starch (up to 30% of DM or more) and, therefore, a source of energy. In India, it is reported to have a higher nutritional quality than sorghum and pearl millet, with none of their drawbacks, such as HCN in sorghum or oxalates in pearl millet (Chaudhary et al., 2012). Maize leaves may be richer in protein than the whole plant, but they are poorer in energy since they do not include maize ears. Maize green forage is a valuable feed for ruminants in terms of yield and nutritive value (Sarap et al., 2015), though supplementation may be needed to compensate for its low protein, mineral and vitamin contents (Bwire et al., 2002; Tauqir et al., 2013). Maize forage is particularly effective in optimizing milk yields of dairy cows (Brewbaker, 2003). Digestibility and nutritive value of the whole maize plant, fresh or ensiled, have been widely studied, especially using sheep (see the references in Andrieu et al., 1974). The feed value of maize is much greater, up to 35% more, when the whole plant is harvested (Brewbaker, 2003). From flowering to grain maturity, the whole plant shows a nearly constant OM digestibility (71-72%), because the increasing proportion of maize ear, which has a high and constant digestibility (83%), compensates for the decreasing digestibility of the rest of the plant, from 70% to 60% (Demarquilly, 1969 cited by Demarquilly et al., 1992). As with other forage crops, the best predictor of the whole plant digestibility is its indigestible cell wall content (Andrieu et al., 1993). Digestibility does not vary much with variety or with seeding rate. However, maize varieties selected for their quality or including the Brown Midrib gene, which decreases the plant lignin content, can result in a digestibility higher by 3 to 5 percentage points (Demarquilly et al., 1992). Some sterile varieties have existed, which were well ingested due to their high soluble sugar content, though their OM digestibility was lower than that of fertile varieties (e.g. 65% for the “sucrensilage” variety, Andrieu et al., 1974). In India, in vitro OM digestibility (83 vs. 79%) and ME (10.2 vs. 9.2 MJ/kg DM) were higher for fresh baby corn forage than for baby corn silage (Bakshi et al., 2012). Maize green forage is not commonly fed to dairy cattle in Europe, unlike in many tropical countries. For example, in India with low yielding dairy cows (5 kg/d of milk), 10 kg of maize green forage replaced 1 kg of concentrate mixture in the diet without affecting milk yield, when roughage such as straw was provided ad libitum. Total intake was 3.86 kg DM/100 kg LW, including 0.8 kg DM/100 kg LW of concentrate, 1.6 kg DM/100 kg LW of maize green forage and 1.4 kg DM/100 kg LW of sorghum straw. Body weight gain was 11 kg over 45 days, and average milk yield was 4.9 kg/d. The higher level of inclusion of maize green forage as a replacement for concentrate in the diet resulted in lower feed costs and a higher net profit per animal per day (Naik et al., 2012). Maize green fodder is not commonly fed to growing cattle in Europe but is considered valuable for that purpose in India, the USA and Canada (Sarap et al., 2015; Potter, 2012; Newport, 2006). In India, crossbred heifers fed solely on green maize leaves (26% of DM) had a DM digestibility of 65% and a DM intake of 3.94 kg DM/100 kg LW. Total body weight gain was 53 kg, indicating that the green maize leaves as a sole feed were sufficient for satisfactory maintenance and growth (Sarap et al., 2015). In Pakistan, the DM intake and DM digestibility of maize green forage, fed to 18-20 months Sahiwal heifers, was 5.87 kg DM/100 kg LW and 62%, respectively. Supplementation with urea and molasses increased feed intake (6.36 kg DM/100 kg LW) but not DM digestibility. Daily weight gain was higher for heifers given green maize fodder and urea (0.77 kg/d) compared to the fodder alone (0.58 kg/d) (Tauqir et al., 2013). In Mississippi, heifers grazing maize green forage gained more than 1 kg/day and the pasture sustained a total weight gain of 500 kg/ha in only 75 days (Newport, 2006). In India, nutrient digestibility of fresh baby corn husks, fed ad libitum to male Murrah buffalo calves, was higher to that of green maize forage, but DM intake was lower. Nitrogen retention was also higher for baby corn husks. 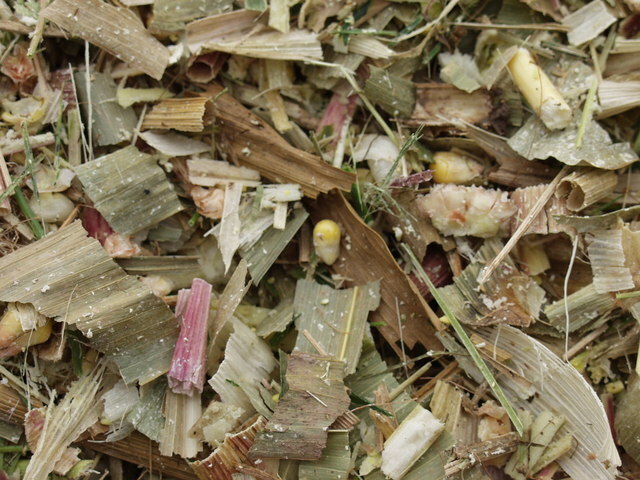 When offered as a total mixed ration with wheat straw and a concentrate, baby corn silage enabled even higher nutrient digestibility, voluntary intake and N retention. Baby corn husks were a highly acceptable and palatable forage compared to conventional maize fodder (Bakshi et al., 2012). In Europe, whole maize plants harvested after flowering were characterized from 82 trials with sheep. The mean DM content was 23% (14-33%), mean OM digestibility was 72% (67-80%), and mean DM intake was 53 g DM/kg LW0.75 (range 38-67 g DM/kg LW0.75) (Demarquilly et al., 1992). At later stages, OM digestibility increased from 67% to 69% from the milk stage to full maturity, while DM intake decreased from 72 to 61 g DM/kg LW0.75 (Kirilov, 1999). In early studies with sterile maize in France, green forage had a lower digestibility but intake by sheep was higher (on average by 20% more) than for fertile maize. Sheep ingested between 53 and 71 g DM/kg LW0.75, depending on plant maturity and experimental site. Male-sterile maize green forage was found valuable because its nutritive value did not vary much after flowering, and intake remained high, provided that DM content was over 18% (Andrieu et al., 1974). In India, Barbari goats offered maize green forage harvested at the blooming stage (including leaves, leaf sheath, stems and inflorescences) (allowing for 20% refusals) ingested 40 g DM/kg LW0.75 (37 g OM/kg LW0.75) resulting in 0.21 kg of weight gain over a week. DM and OM digestibility were 75% and 76%, respectively. Increasing the allowance for refusals to 35% and 50% resulted in higher digestibility (81% and 82% for DM and OM digestibility, respectively), higher DM intake (51 and 66 g DM/kg LW0.75 for 35% and 50% refusals, respectively) and higher weight gains (0.30 and 0.35 kg/week). Allowing greater selection by increasing the refusal levels, nutrient intake from maize green forage was found not only to meet maintenance requirements but provided surplus energy and protein for production (Dutta et al., 2000). Pigs can be fed on maize green forage. In India, maize green forage was offered ad libitum as a supplement to concentrates (maize, wheat bran, rice polishings and groundnut meal) to male pigs. Maize green forage represented up to 25% of the diet and the pigs gained 460 g LW/day (Yadav et al., 1990). Green maize leaves have been used for a long time as a forage in rabbit feeding in addition to a concentrate, in Europe (Kubrakova et al., 1979; Schlolaut, 1987), in Africa (Mutetikka et al., 1990; Lukefahr, 1998), and more generally in tropical countries (Raharjo et al., 1988; Lebas et al., 1997). However, when compared to other green forages, maize leaves are considered as a poorly palatable forage for growing rabbits and breeding does (Harris et al., 1983; Adehan et al., 1994). Growth of rabbits fed ad libitum with green maize leaves, in addition to a limited quantity of concentrate, is higher (20.0 g/d) than with Rhodes grass hay (Chloris gayana) (15.7 g/d), but lower than with fresh sweet potato vines (23.7 g/d). This ranking was probably related to the protein content of the 3 forages: 2.7, 12.5 and 15.3% of DM, respectively (Mutetikka et al., 1990). In another trial with rabbits, protein digestibility of maize green leaves was low (44%), but digestible energy was relatively high (8.3 MJ/kg DM) for a forage (Raharjo et al., 1988). Green maize leaves are suitable for rabbit feeding, mainly as a forage with a moderate energy content, but with a low digestible protein content (about 5-6% of DM). It must be used together with a concentrate and is not suitable as a sole feed (Mutetikka et al., 1990).